Printing a Mezzotint is not an easy task, the copper plate itself has a limited strengh and can be used for a limited number of times before being worn out. 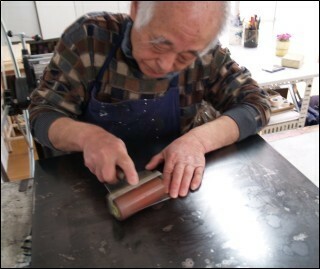 Typically the copper plate used for Mezzotins can be used for up to 40 prints, Toru Iwaya used special croming technique that strenghen the plate and allow to print for up to 100 times. Regardless of that, the plate has still a very limited printing lifespan. For printing, the plate has to be inked and pit has to be perfectly filled with ink and it has to be at the right temperature. Also the paper used in the priting process has to be the right texture, in order to allow the plate to lay the ink exactly as the artist originally envisioned the artwork. Toru Iwaya uses only 100% cotton paper he brought personally from France. The printing task starts by inking the plate, this is accomplished by placing the plate on top of heated base and slowly, with a roll, inking the plate. The inking process takes up to two hours for a full size plate with multiple colors if multiple colors are used, one plate for each color is needed. After the plate has been inked it can be used for printing. One inked plate can be used for only one print. For the next print it needs to be inked all over again. 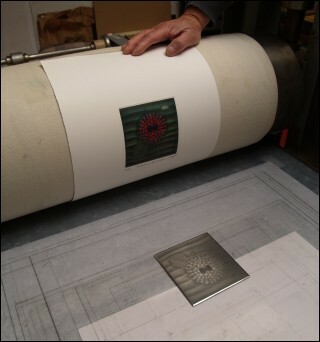 This makes it a time consuming process but it also ensure that each Mezzotint has the highest quality. The printing machine is a heavy-duty custom made electric press.